“Woodchuck,” Whistle-Pig,” and “Land Beaver” all are names used to describe our native Marmota monax the groundhog. I saw one the other day crossing our two-lane highway, AR 23 North, the “Pig Trail Scenic Byway.” I had seen this rodent before and wondered “what animal was that?”. It is now clear what or who he is. He is a “Whistle-Pig.” That is what the mountain folks nicknamed him because when frightened by some predator, he will stand erect on his hind legs and emit a high-pitched whistle to alert his fellow pigs or hogs of danger. 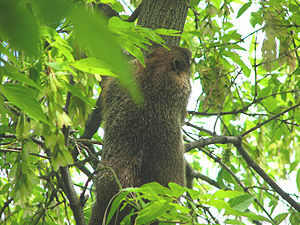 Being the ever so curious person that I am, I did some research and found that groundhogs also can climb trees. 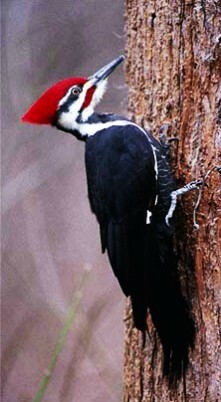 Yes, they can climb trees to escape from predators. I wrote in an earlier post about gray foxes having the same ability. “Whodathunkit?” They also are very good swimmers. Wildlife sightings are daily occurrences for Maggie and I. Not a day goes by that we don’t see at least one deer or rabbit. Our trusty “dawg” Chef keeps healthy by chasing squirrels and deer daily. Communing with nature is awe-inspiring. This entry was posted in Animal, Bird, Flora and Fauna and tagged Gray fox, Groundhog, Groundhog Day, Pileated Woodpecker. Bookmark the permalink.